The Historical Critical Approach to the Bible requires the text to be read in its original context of meaning without regard to later dogmatic systems of belief. What are the strengths and weaknesses of this approach? 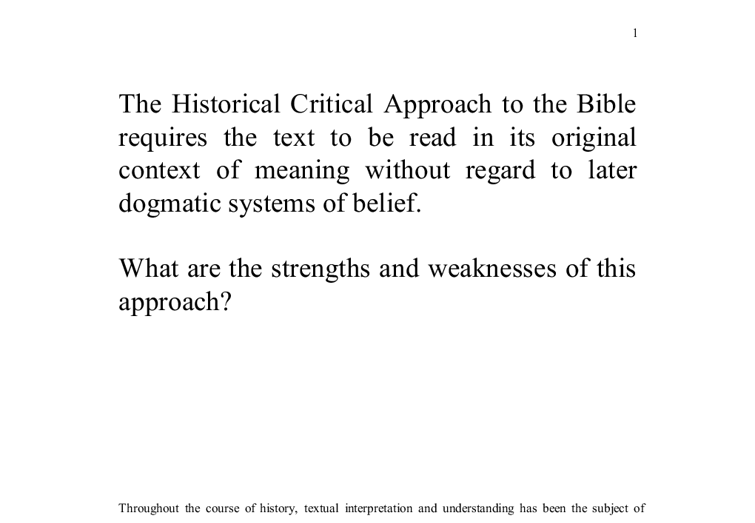 The Historical Critical Approach to the Bible requires the text to be read in its original context of meaning without regard to later dogmatic systems of belief. What are the strengths and weaknesses of this approach? Throughout the course of history, textual interpretation and understanding has been the subject of intense debate. Interpretation of a text has as its primary goal understanding of that text. However, it is important to identify that understanding is not always unambiguous, perspicuous and 'immediate'. Understanding may be realised through an ongoing process of interpretation; a process which ultimately aims to fully comprehend the given text. However, the apparently unambiguous term 'comprehension' betrays complex procedures of interpretation and diverse and radically opposing views as to what this term is seen to constitute. Hermeneutics, in relation to Biblical texts, is defined as the theory of text-interpretation, concerned primarily with the analysis of specific techniques of textual interpretation, the relationship between the interpreter and the text, and the process and result of the application of a specific interpretative mode.1 Within this essay, we concentrate on the historical critical approach, and analyse its aims, strengths and weaknesses. However, before introducing the historical critical approach, it may be worthwhile to briefly recount the theories, techniques and modes of interpretation that preceded its formulation. At the time of the Fathers, interpretation of the Bible was consigned to the intellectual, the learned and those schooled in theology. Texts were seen as referring to the doctrines espoused by the Church, doctrines that were contained within Scripture. In order to excise such beliefs from the text, many Fathers (most notably the Alexandrians) were seen to employ an allegorical mode of interpretation, based on the knowledge that allegory highlighted the deeper significance and profound meaning that the text was ultimately trying to portray. Interpretation was inspired by the Holy Spirit, who transformed the 'sensible' into the 'spiritual'.2 Clement of Alexandria, Irenaeus and Origen utilised allegorical interpretation to its full capacity. ...read more. majority of the New Testament is found in its original form.25 Christian supersessionist thinking is again apparent in the work of Old Testament scholars such as Martin Noth, whose 'disciplinary boundaries [of periodization] have been drawn on grounds that are more confessional than historical'. 26 It is no wonder, according to Levenson, that Judaism regards this method of interpretation to be extremely subjective and indeed blatantly anti-Semitic in its concerns.27 That the text is to be read in its original context of meaning immediately asserts that the historical critical approach allies the moment of composition and origin of a text as the moment of objective truth and original meaning. However, scholars such as Bultmann have noted that due to the very nature of the Scriptural texts, the authors did not wish the text to be 'tied' to a particular culture or moment in history, rather the text automatically becomes free at the moment of composition in order to 'make itself free for new relationships'; thus 'the meaning of Scripture discloses itself anew in every future'.28 The historical critical approach therefore assumes that the truth of the text is hidden within the past, within history, therefore asserting that constant re-interpretation is merely shrouding the original context of meaning. In this sense, therefore, the meaning of the text can be seen as relevant only to those to which the text was revealed; therefore the original context and truthful meaning can never be retrieved, as historical circumstances can never be fully replicated. A hermeneutic of retrieval of the past is to deny that the original truth of the text may in fact only be acquired in the future.29 Indeed, how do advocates of the historical critical approach interpret John 16:7-15 or 1 John 1:1-3 in which the author of the Fourth Gospel states that the truth and real meaning of the events as described will not be revealed until the future and that the witness he provides in the text is relevant to all communities at all ...read more. others...'58 Transcendence of historical conditioning is therefore impossible, as we have seen in the approach asserted by Gadamer and many other scholars.59 Of equal importance is the attempt to apply a rigid method of interpretation to Scripture, rather than a flexible technique. To impose a scientific method on a subject within the humanities is unfair and unreasonable, and, as a consequence, is seen to prove extremely problematic. To talk of engaging in a process of understanding (as above) is to necessarily suppose engagement with the text, and to engage with the text is to see the text as relevant in a faith context today. Indeed, a possible meaning of 'hermeneutic[s]' in Greek is 'engagement' and 'translation', i.e. translation from the past to the present.60 Tradition is not therefore to be disregarded, but to be seen as an essential hermeneutical principle, and 'an act of reason' in itself.61 It is also worthy to question whether the historical critical approach actually concerns itself with the attainment of the original context of meaning, or whether its objective is merely to admonish and dismiss tradition in general. 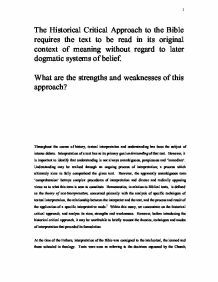 Again, it is possible to argue against the assertion of the need to attain the 'original context of meaning', for 'not occasionally, but always, the meaning of the text goes beyond its author'.62 To advocate an approach that deals merely with the historical past, which assigns no present relevance to the text, and which ignores the theological witness of the divine revelation contained within it is to reduce hermeneutics to what Watson terms 'Ebionite impoverishment'.63 In order for understanding to take place, one must be aware of pre-conceptions and presuppositions, aware too of the history of the text and its origins in the sense of historical consciousness, but also aware of the possibility of engagement with the text through tradition; there is need of a relationship between ecclesiastical dogmatism and historical criticism,64 and if ever present, could perhaps result in significant positive progress being made in the field of Biblical Hermeneutics. ...read more. In advertisement 1the light is focused on the woman from a range of angles because she is the most important image. Even though the woman is being illuminated from different places. There seems to be brighter light shining onto her right side. His facial expression is serous and controlling, showing her who is boss. His facial expression contradicts his touch. He show affection with his touch but his facial expression shows no affection whatsoever. This raises the question as to whether or not his affection is genuine or a false act of communication? This code attributes basic meaning to the advert, whose conventional combination of iconic image and linguistic representation (of words and pictures) allows the recipient to receive a message, which is justified and reiterated by the relationships of resemblance at play. the protagonist buying Kellogg's crunchy nut but can't wait to get home and decides to eat it straight away sometimes stealing it or going to great lengths to protect it. The purpose for each Kellogg advert is to show how amazing and tasty their corn flakes can be. I think that if I was given a larger budget to work with my advertising campaign would improve immensely because advertising on posters doesn't really compare with advertising on TV or London billboards in prime positions. To market my business successfully I think that I would require at least �5,000 but with 10,000 more it would be a perfect budget. Greenpeace Fund, Plant Life and Earth Watch would support mother nature when we are tearing it down. Cancer Research and The Breast Cancer Fund help women who are suffering from one of the most deadliest decease around. All these charities help all living things by getting medical equipment which would help them get back to normal and well again. Also there were various online contests to compete for consoles before launching. The hard-core PC gamers (mostly male) are usually the only people with high speed Internet access; since they cannot resist "the most powerful computer ever sold specifically for gaming", it is most likely that they will participate.